Great fishing comes to those who fish in Iowa. Fish for every angler are found across the state, no matter the month, whether a trip is planned during an icy January or under the sweltering sun of August. 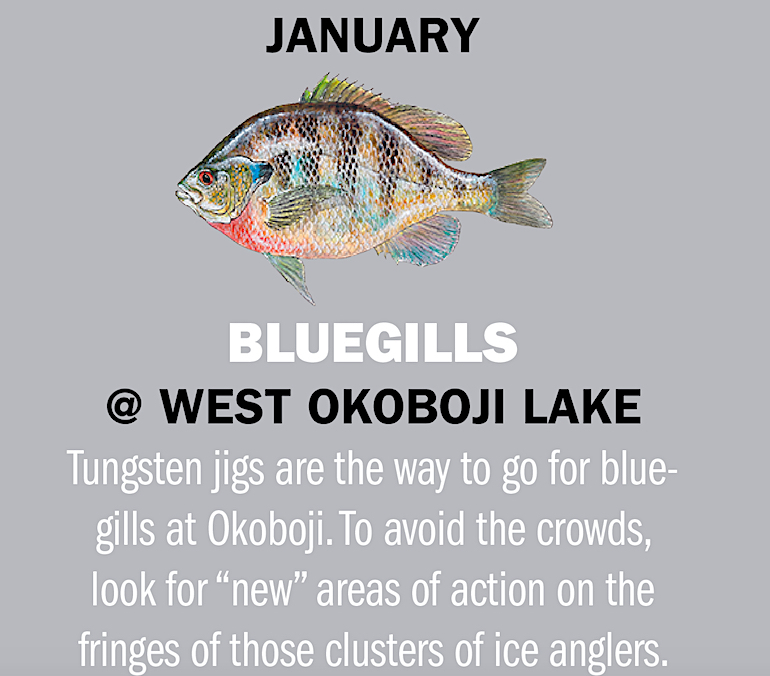 The bluegill population in West Okoboji Lake is huge in both size and numbers. Eight-inchers are average fish, with a lot of 9- to 10-inchers keeping the action hot beneath the ice. Finding fish is as easy as following the crowds of ice shacks and pop-up ice-fishing shelters, but don’t feel like you need to join the crowds. Local fishing guide John Grosvenor suggests anglers find “new” areas of action on the fringes of those clusters of ice anglers. Target the edges of last year’s weed beds in or near the mouth of Emerson Bay, Millers Bay or other bays. OTHER OPTIONS: Yellow Perch, Big Spirit Lake: The lake might lack perch in numbers, but it makes up for with 1- to 2-pound fish. Crappies, Don Williams Lake: A large population of crappies in this lake is growing into the 9- to 10-inch range. 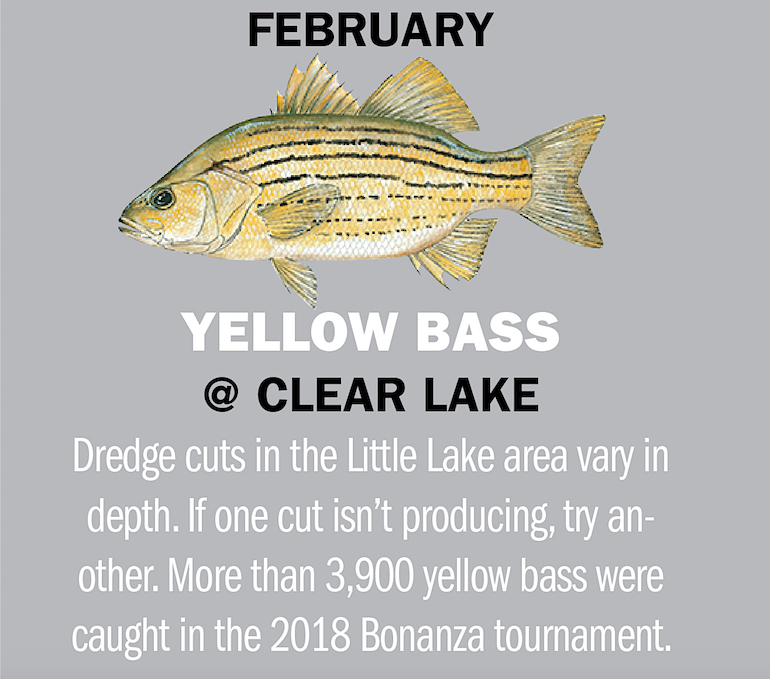 The population of yellow bass available to anglers at Clear Lake, in north central Iowa, is exemplified by the more than 3,900 yellow bass caught during last year’s one-day Yellow Bass Bonanza ice-fishing tournament. This year’s tournament is February 10. Yellow bass are native to Clear Lake and traditionally experience a boom-and-bust cycle every three to five years. The through-the-ice bite starts over the dredge cuts in the Little Lake area and moves into the main lake as winter progresses. Wandering schools of yellow bass offer incredible fishing but require angler mobility to find and stay on top of them. OTHER OPTIONS: Big Creek Lake, Bluegills: Bluegills average 9 inches long and are found along the drop-offs associated with the old roadbeds that run through the main basin. Urban Ponds, Trout: The state stocks more than 20 ponds in or near urban areas each winter. Learn more online on the “Urban Trout” page at iowadnr.gov. 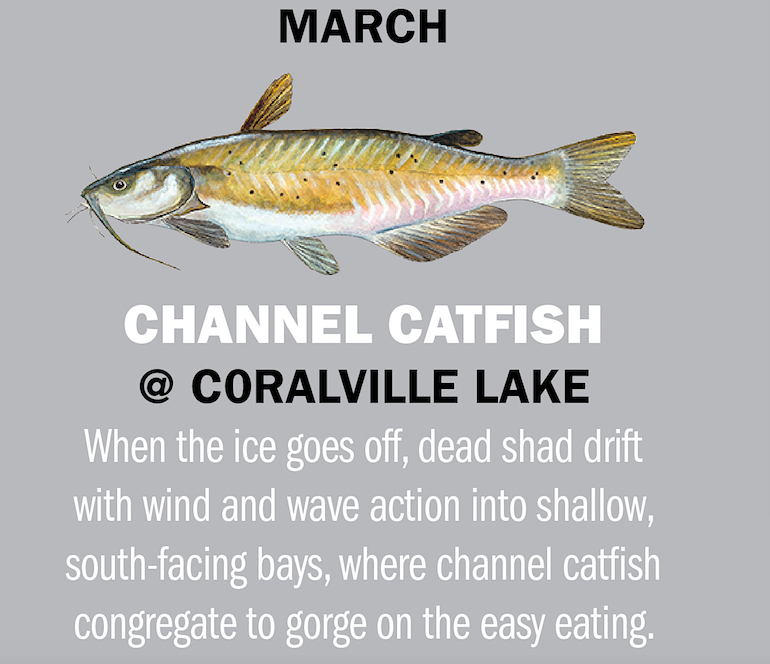 This sometimes phenomenal dead-shad bite for channel catfish has occurred as soon as early March at Coralville, Saylorville and Red Rock reservoirs. When the ice goes off, the carcasses of winter-killed shad drift with wind and wave action into shallow, south-facing bays, where channel catfish congregate to gorge on the easy eating. Anglers who fish shorelines in those bays, in as little as 2 feet of water, can catch 2- to 5-pound cats on nearly every cast. Commercially manufactured soured-shad works well. Dead shad collected from the shoreline and cut into chunks makes great bait, too. Wear disposable latex gloves to avoid taking the bait’s vile smell home with you. OTHER OPTIONS: Yellow Perch, Dale Maffett Reservoir: A 7.6-mile “out and back” trail leads from the east-side park area, providing access to the lake’s southern shoreline. Farm Ponds, Largemouth Bass: Sow bass ease out of the cool depths to sunbathe in shallow, south-facing, mud-bottomed coves. A window of opportunity opens between the roiled waters after ice-out and the floodwaters of early spring rains when the Des Moines, Iowa and other major rivers run relatively low and clear. 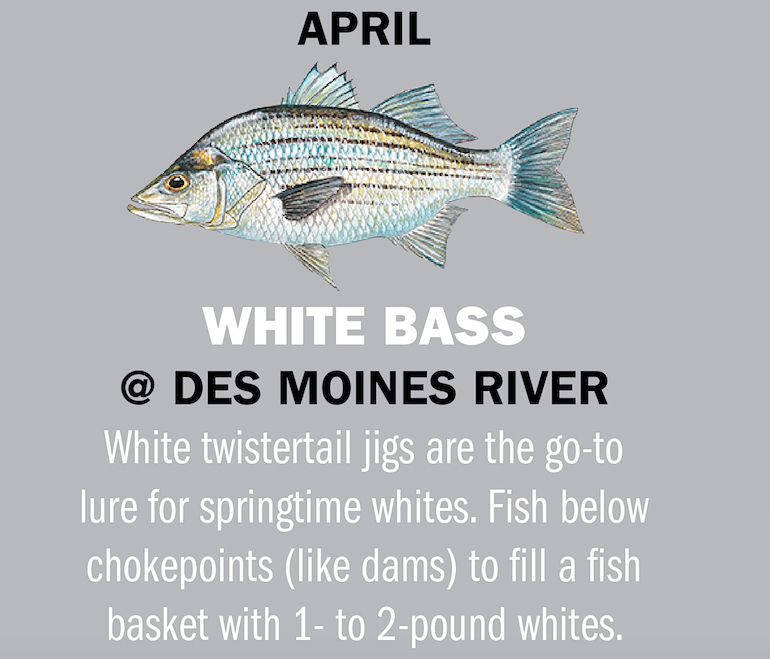 If that window coincides with the annual white-bass spring run, anglers fishing below chokepoints (like dams) can fill a fish basket with 1- to 2-pound whites. If the main rivers are a little muddy or high due to snowmelt or rains upriver, anglers can target the lower ends of tributaries that feed into the main rivers as whites move into those clearer waters. White twister-tail jigs are reliable lures, when sized to bounce just off the bottom when retrieved upstream. OTHER OPTIONS: Big Spirit Lake, Bullheads: Bullhead numbers are down, but the fish are nearly monstrous in size, often approaching 2 pounds. Little River, Walleyes: Significant walleye-friendly structure has been added to Little River Lake near Leon, attracting walleyes in numbers. Thousands of anglers converge on the Iowa Great Lakes the first weekend in May for the walleye “opener,” following the state’s closure of the fishery in mid-winter, when fisheries personnel gather walleyes and strip eggs for use in their hatcheries. Rocky reefs along the east shore of Big Spirit Lake are traditional targets for anglers in search of walleyes up to 5 pounds. On West Okoboji, fish rock reefs at the mouth of Miller’s Bay and Emerson Bay. If the Big Spirit Lake/East Okoboji Lake spillway is flowing, fish the edge of the delta below the spillway. Jigs and minnows, along with trolled Rapala-type crankbaits, are go-to baits. OTHER OPTIONS: Lake Red Rock, Crappies: Crappies here are hard on anglers’ hearts: They often reach a heart-stopping 14 inches. Inland River Channel, Catfish: Channel cats congregate below dams and near the mouths of tributaries to larger rivers. Meadow Lake, north of Greenfield in Adair County, is an example of the excellent largemouth bass fishing found in the hundreds of County Conservation Board lakes across Iowa. From 10 to 30 acres in size, these small lakes produce great fishing for 1- to 2-pound bass. Bigger bass are more accessible when they move shallow at spawning time this month.After the spawn, the bigger bass move offshore. Target them over or around submerged brush piles, deep points and old creek channels that are “invisible” and, therefore, less-fished by casual bass anglers. Pull jig-and-pig combos or plastic worms alongside structure. Work weedless jigs and worms over the tops or around the edges to catch bigger bass. OTHER OPTIONS: South Skunk River, Flathead Catfish: Big flatheads congregate near riprapped bridge abutments and other structure that provides the “holes” flatheads seek for spawning. County Lakes, Bluegills: Iowa’s County Conservation Board lakes, such as Meadow Lake and Lake Greenfield in Adair County, are stuffed with easy-to-catch bluegills. Walleyes are said to avoid bright sunlight, prefer cool water, and head for deep water once water temperature exceed 85 degrees. But nobody told Rathbun’s walleyes that rule. For decades they have haunted shallow bays and weedy flats between Rolling Cove and Island View camping areas at midday during the hottest part of summer. Anglers who troll Rapala crankbaits in those and other shallow areas with weedbeds routinely boat their five-fish limits. Other anglers have discovered a similar midday, hot-water bite in shallow areas of Big Creek Lake, north of Des Moines. Work the weedline along the east side of that bay for walleyes … and an occasional muskie. OTHER OPTIONS: Lake Red Rock, White Bass: White bass are in the “jumps,” busting schools of shad on the surface and taking topwater lures and shallow-running crankbaits. Saylorville Channel Catfish: When the lake is at normal pool level, Saylorville channel cats cruise the flats associated with the old river channel. The emergent weedbeds in the southeast corner of Big Spirit Lake are models for places to catch muskies in August on Okoboji, Big Creek, Brushy Creek, Twelve Mile lakes and other muskie-stocked waters. At Big Creek, work a monster-size Cowgirl, Medusa or other muskie lures along weedlines. Muskies aren’t “common” in any Iowa lake, but populations in Big Creek, Twelve Mile and Brushy Creek produce consistent catches for anglers willing to do the work required to catch these stubborn fish. OTHER OPTIONS: Channel Catfish, Inland Creeks: Wade from hole to hole for 1- to 5-pound channel cats in small rivers, commonly called “creeks” in rural Iowa, and drift chicken liver, shrimp, stinkbaits or cut-bait into those holes. Urban Lakes, Panfish: Copper Creek Lake in Polk County — and urban ponds in Ankeny, North Liberty and other communities — provide quick, close-to-home fishing trips for a quick meal of panfish or simply a pleasant midweek break. Blue catfish are found in Iowa only in the Missouri River along the state’s northwest border and in the Mississippi River along the state’s eastern border. (There’s an experimental stocking of blue cats in Three Mile Lake in southern Iowa, but the jury is still out on whether that stocking will “take.”) Some of Iowa’s biggest blues, up to more than 100 pounds, are pulled from the Missouri River in September thanks to a steady river level and consistent water conditions. Blue cats favor fast water. Look for them at the tips of wingdams, along outside bends, and at the upper ends of mid-river holes. Tempt them with large chunks of bloody, oily baits such as cut skipjack or shad. OTHER OPTIONS: Small Rivers, Channel Catfish: Large congregations of 2- to 7-pound channel catfish gather below rock riffles in small rivers. Northern Iowa Muskies: Fish the well-defined weedlines of Clear Lake, Spirit Lake, West Okoboji Lake and Brushy Creek Lake. The cool-water streams of northeast Iowa are goldmines for smallmouth bass when the leaves change colors and waters cool. The Yellow, Upper Iowa, Upper Cedar, Upper Wapsipinicon, Upper Maquoketa and other rivers in the area flow clear and steady during autumn, making them ideal for wading, canoeing or kayaking. Target 2- to 4-pound smallies with white twister-tail jigs, Mepps inline spinners or small Rapala crankbaits at the base of rocky cliffs or below the riffles of rock bars. Never overlook logjams or structure more commonly associated with catfish; a current break is a current break, and smallmouths love any opportunity to ambush prey while sheltered from the current. OTHER OPTIONS: Northeast Iowa Streams, Trout: Come autumn, a strong population of stocked brookies and brownies can be targeted by fly- and spin-casting anglers. Mississippi River Backwater, Crappies: As the backwaters of the Mississippi River cool, crappies migrate to the relatively few deep-water areas, such as Brown’s Lake. For decades, the state stocked fingerling walleyes in many of Iowa’s major rivers. The result is a strong population of walleyes in these waters, weighing up to 9 pounds, that go on a bite each November. Low water levels combine with walleyes’ natural migration to wintering holes, building concentrations of fish near rocky structure in the Des Moines, Raccoon, Iowa, Cedar, and other rivers across the state. Some anglers take this bite so seriously, November is the only time they fish for walleyes. Sunny days are certainly pleasant times to spend on a river, but specialists say the best bite is on “Carhartt Days”— cold, windy, sometimes rainy days, when coveralls and hooded sweatshirts are mandatory. A few diehards swear the only lure you need for November walleyes is a Hammerhead jig. OTHER OPTIONS: Urban Ponds, Yellow Perch: The city of Ankeny, in central Iowa, has experimentally stocked yellow perch in several ponds listed on the City of Ankeny’s website. Wintering Holes, Flathead Catfish: Anglers who fish huge white swimbaits or twister-tail jigs slowly on the bottom can catch flathead catfish that migrate to wintering holes where they congregate and feed prior to going dormant during winter. Anglers who know the locations of Mississippi River backwaters at least 8 feet deep, with a faint current (that keeps water oxygenated under the ice) moving through them, know prime places to drill holes in the first safe ice to catch crappies congregated in those areas. Deep-water areas associated with marinas are obvious, good places to drill holes in the ice. Dredged areas in Pool 12 such as Sunfish, Tippy, Kehough and Stone lakes are prime locations to find midwinter backwater crappies, too. 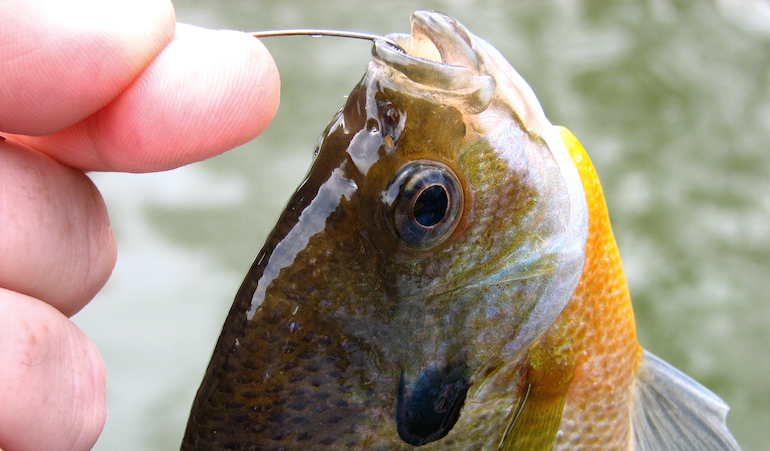 Spikes (maggots) and waxies (waxworms) catch a lot of crappies, but 1- to 2-inch minnows catch the biggest crappies. OTHER OPTIONS: Urban Lakes/Ponds, Trout: Ponds and small lakes near urban areas provide local trout fishing through the ice. See the list on the “Urban Trout” page of the IDNR website — iowadnr.gov. Big Spirit Lake, Yellow Perch: The bite through the ice for a waning cycle of truly jumbo perch will start in Anglers Bay and move into the main basin after New Year’s.